In this weeks Collection video we look at a Link’s awakening Game Boy Bundle. 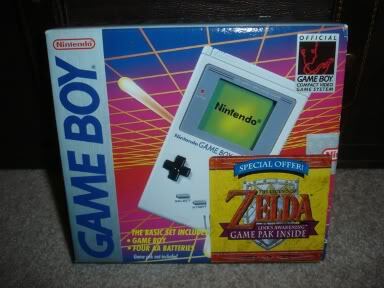 While it wasn’t the first Legend of Zelda bundle deal, it was the first for a Handheld. We have since gotten great Bundle deals for several handheld Zelda games, including The Minish Cap, Phantom Hourglass, and most recently with Ocarina of Time 3D. This Link’s Awakening bundle however, is nothing like the more recent ones as the actual console is just a plain old Game Boy, with no special Zelda goodies. 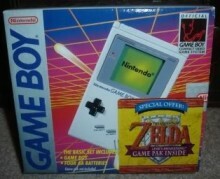 The actual packaging is that of a standard Game Boy. All Nintendo did with this one is open up the package, toss in a copy of Link’s Awakening and its game manual, and then reseal it with a Nintendo sticker. They then added the Special Offer stick on the front of the Game Boy Package and there you have it, a bundle. Hardly the same as the special Gold Game Boy Advance SP, Gold Nintendo DS, or 25th Anniversary Nintendo 3DS that we got with later bundles. In any case, go ahead and make the jump to check out the collection video. As always, be sure to subscribe to us at YouTube to get all the latest Collection Videos as they release.